The Housing Department has also confirmed that the waiting list for home ramps is up to 10 months. 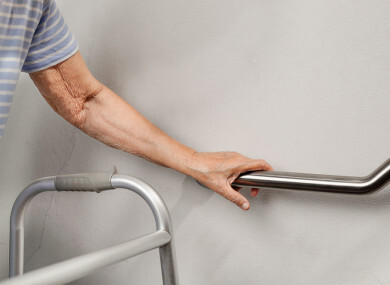 ELDERLY PEOPLE ARE being forced to stay longer in hospital as it is taking well over a year for local authorities to carry out home adaptations. TD Richard Boyd Barrett said the wait times for walk-in showers for the elderly and the disabled in his own constituency of Dun Laoghaire is 18 months. “A lot of those people cannot be released from hospital and are blocking up beds because they cannot get a walk-in shower,” he said. “People often cannot be released from hospital because of this. The council says it is because it has difficulty getting contractors to do the work. They are absolutely unacceptable waiting times for people who really need things such as ramps, grab rails and showers in particular,” said Boyd Barrett. The average time for grab rails and stair lifts to be fitted in homes is one month. Other miscellaneous fit-outs are taking up to 12 months, on average. Report from Dun Laoghaire Area Committee on council house adaptations. This doesn’t appear to be a new problem. In 2015, Age Action said delays in home care packages and home modifications were holding up hospital discharges. At the time, Age Action spokesperson Eamon Timmins said HSE figures showed that 17% of people in delayed discharge beds at the time were due to be discharged home, but were awaiting approval of a range of supports such as home care packages and home adaptations. For the first nine months of last year, HSE figures show there were 142,472 delayed discharges across all public hospitals in the State. The difficulty in tendering and hiring for contractors to do the works is one of the main issues causing the problem, according to Solidarity-PBP TD Boyd Barrett. He said the obvious answer would be for people to be directly employed by the local authorities. In previous years, workers were directly employed in maintenance departments of local authorities to carry out the upkeep of council-owned properties. Boyd Barrett argues that the outsourcing of these contracts has resulted in tendering processes that can take up to six or eight months to identify a contractor. “We would have people employed by the local authorities directly to go out and install these things for people with disabilities and the elderly. Would the Taoiseach consider that? The unacceptable situation in Dun Laoghaire is almost certainly replicated right around the country. It is people with disabilities who are suffering the consequences,” he said. The Taoiseach said delays are due to “a labour and skills shortage across the construction sector”. Email “Elderly people can't leave hospital due to council taking up to 18 months to fit walk-in showers and ramps”. Feedback on “Elderly people can't leave hospital due to council taking up to 18 months to fit walk-in showers and ramps”.